Patients may also choose veneers to achieve an ideal smile. Patients who are candidates for veneers have little if any restorative work already done on their front teeth. Generally, patients who have veneers have severely discolored front teeth, cracked/chipped/misaligned front teeth, or spacing in between their front teeth. Veneers are a simple way to have a “facing” put on their teeth while preserving most of the natural tooth structure of the teeth. The preparation for veneers is painless and requires minor shaving down of the front surfaces of the teeth. Veneers are made of compressed porcelain and are bonded to the face of teeth much like artificial nails are applied. Veneers are fabricated in a laboratory using the most state of the art techniques. 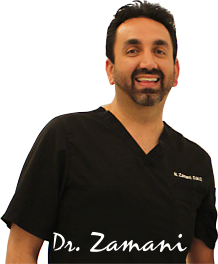 Dr. Zamani utilizes dental laboratories, which use the highest quality of materials and porcelains available. 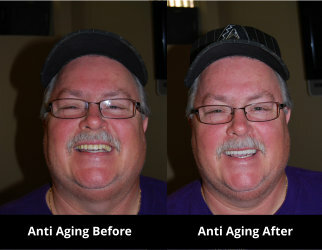 During the time of laboratory fabrication, patients wear temporary veneers, which look very natural. In many cases, patients choose to have all six of their front teeth veneered to achieve a “ Hollywood” smile. By having veneers placed on all six of the front teeth, the lab can fabricate a natural smile line and avoid an unnatural look. The patient is also able to play an active role in the shade and shape choices of their veneers. In many cases, the patient is actually sent to the lab to have a custom shade chosen for the teeth to achieve a very high quality and natural result.